It's freezing here in Scotland, so I am literally shaking, but the shakes I'm talking about are of the milky variety. I've made smoothies for Cooper since he was a weaning baby, but making milkshakes is a new craze in this house. 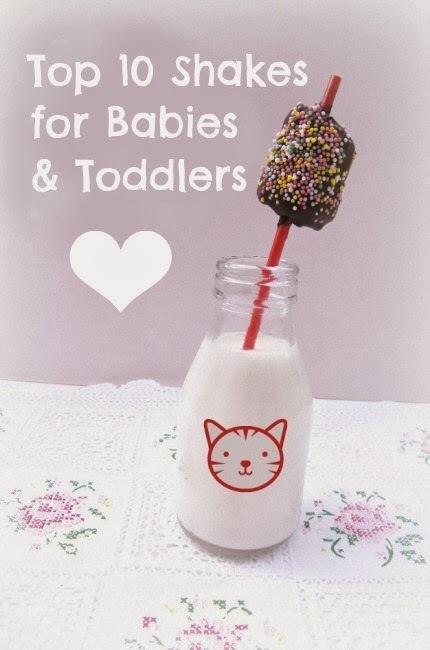 Earlier this month I shared my Chocolate and Avocado Super Shake with you and today over at Baby Centre I shared the Top 10 Milkshakes for Babies and Toddlers, although to be fair they are perfect for most adults too. Today's fresh shake is mango and apricot with a pinch of spice. I used frozen mango chunks and a tin of apricots in juice that I was getting sick of looking at in the cupboard. I think a PR sent them to me when I was trying out a recipe for them and they have sat there glaring at me accusingly ever since. If you are wondering about the fat lump on that straw, it's a banana pop. Never heard of them? Cooper has a post where he shows you how to make them with step-by-step photos, if you're interested. A healthy shake made with simple ingredients and a hint of spice. Now for a more adult drink. It's my hubby's birthday today and Waitrose kindly sent me some Champagne to celebrate as well as some birthday pieces. I decided to make him a Ginger Mango Champagne Cocktail, but it didn't go to plan. 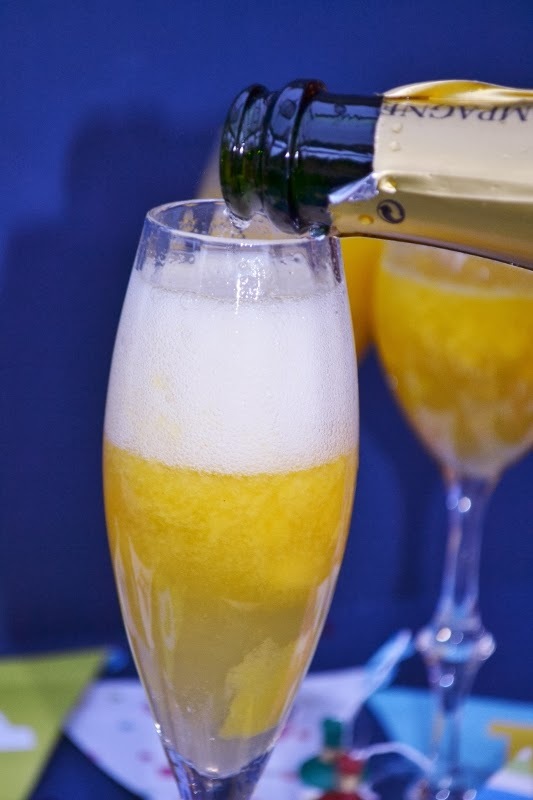 I whizzed up some fresh mango with apple juice and then I topped it with some ginger beer and some champagne. It tasted good, but it separated and I just couldn't get the head on the champagne to stay for more than about 10 seconds, so crappy photos and a bit of a disastrous recipe. Hey ho, we'll just have to drink the rest straight! 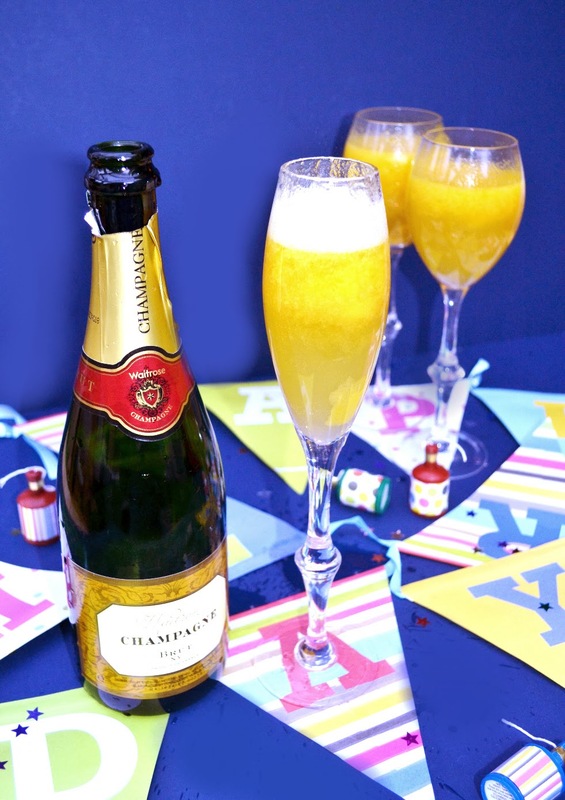 If you want to make a rather more successful champagne cocktail, head over to Waitrose where there is a collection of Champagne recipes that won't go wrong. They also have a selection of Champagne recipes for savoury dishes and desserts that would be perfect for Valentine's Day. Disclosure: Waitrose sent me some Champagne, party accessories and a photo frame for Graham to enjoy on his birthday. I was not required to write a positive review and any opinions expressed are my own. The milkshake sounds LUSH! 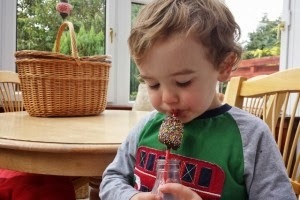 Though I've so far totally failed at getting my kids to drink smoothies or milkshakes. Weird hey? Whereas I love them. And I hadn't thought of using tinned fruit in a shake, great way to use up those excess cans that build up, I've quite a few! I know that is funny, but your kids are great at eating veg Lou, so it doesn't matter quite so much. Well it's a shame the cocktail didn't go according to plan, because it sounds fabulous. The milkshake sounds good too and a whole lot better than the special Nesquick treat I was allowed about once a year! I must start making some shakes, I cannot stand cows milk, but home made nut milk wouldworka treat. This sounds delicious. Yes a nut milk would work really well Helen. Oh well, that is another post altogether. The banana pops are good and easy to make. The straw looks pretty and the smoothie sounds delicious. What a shame the mango and fizz separated. Oh well, as you say, you can always just drink the bubbly on its own! Yes, the straws are rather pretty. I am totally won over by paper straws, It's a much nicer experience to drink through a paper straw. I really like the sound of that milkshake - my children love them, I too use tinned fruit in milkshakes as it is usually more economical. You are right there, I also think frozen fruit is very good quality and better value than fresh. OMG, I absolutely adore mango and I never realised that you could get frozen mango. I really want to get some. Yummy shake too. It's really handy to have in the freezer and cheaper than fresh quite often. The great thing about adding frozen fruit is you don't have to add ice cubes which can dillute the flavour as they melt. Ahh now that is a great idea Dannii, I shall try to remember to do that too! Ah, at least the champagne was free! The milkshake sounds gorgeous, if a bit chilly. But toddlers, as I recall, don't feel the cold and are happy to drink anything as long as it has a straw. Cute lunchbox too ;-) Yours or Cooper's?? It's cosy here in the house Kellie, so chilled shakes are fine. The lunchbox is mine, a gift from a friend at work. I love it, so retro! 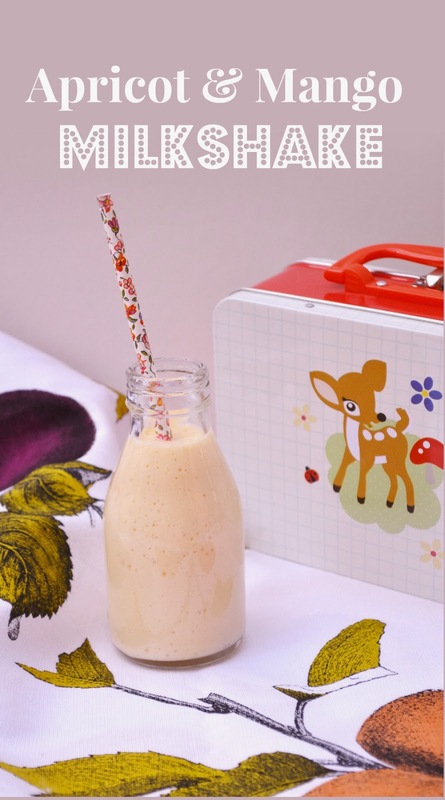 Lovely smoothie, I love tinned apricots, could just eat them out of the tin! Shame about the champagne, but thanks for sharing your woes! Ahhh well I don't usually, but I thought I would then at least you could have a laugh. I know, I am sorry I missed it but we had a great time in Glasgow for Graham's birthday. The transport museum was a revelation. Fabulous! Thanks Sylvia and me too, although I don't actually have them that often. Don't know why not. Thanks, unfortunately their was only one glass left, but I did enjoy it! Yummy shake Jaq, that banana pop looks so scrumptious! Great mix of flavours, sounds lovely! My OH loves mango milkshakes and always requests them during the hot weather. Never thought to add apricots into the mix, will have to try this next time. Shame about the champagne cocktail not working out.